Food poisoning is potentially dangerous which can cause illnesses and even death. The symptoms can begin within hours or even days of exposure. 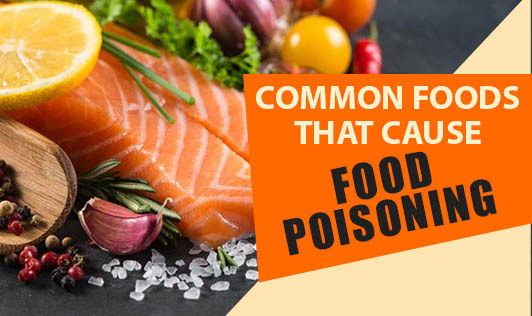 Learn about the common foods which cause food poisoning. Meat and poultry: Raw, undercooked or contaminated mutton or chicken are potential sources of food poisoning. Campylobacter jejuni, E. coli, L. monocytogenes and salmonella are bacteria that may cause you to become sick after eating contaminated meat or poultry. Meat can also become infected with food poisoning after being left out in the heat or at room temperature for too long before or after it is cooked. Always make sure that it is stored in the correct temperature. Avoid cross-contamination by keeping cutting boards and utensils separate from other foods. Eggs: Salmonella is the most common bacteria to contaminate eggs. Possibly present on both the shell and on the egg itself, salmonella can make you ill if you touch the contaminated shell and then contaminate utensils, refrigerator door handles or raw foods from not washing your hands. Store eggs in the refrigerator at less than 7 deg Celsius, throw away eggs that are cracked or appear dirty, and sanitize surfaces contaminated with raw eggs. Cook eggs completely before eating. Sprouts: Sprouts have the potential to harbour salmonella, Listeria and E. coli bacteria. Sprouts are usually consumed without cooking, used usually in salads. If it is home made, it is safer to use. Avoid raw sprouts entirely if you fall into one of the high-risk groups, such as being elderly or pregnant or having a compromised immune system. Fruits and Vegetables: Even if you thoroughly wash fruits and vegetables, bacteria can still be lurking within the leaves and other surfaces. Fruits and vegetables can be contaminated by improper handling, being watered with contaminated water and after being fertilized with contaminated manure. Lettuces, spinach and other leafy vegetables are particularly susceptible to food borne illnesses. Purchase your fruits and vegetables from a known local grower, if possible. Wash and dry before eating and discard any overripe or limp produce. Seafood: Seafood is also easily prone to becoming contaminated by bacteria. Fresh seafood should be kept live or frozen until cooked to prevent bacteria from forming or to kill existing bacteria. Freezing does not kill bacteria, but it prevents it from multiplying. Next you time munch on something raw or even consume some meat in a restaurant, make sure it is hygienic.